Since 2008, Anne Thornley-Brown, MBA, President, Executive Oasis International has created engaging content for our company blogs. Anne Thornley-Brown, President of Executive Oasis International, is a professional team building and meeting facilitator, OD specialist, keynote speaker, and well respected blogger. Anne Thornley-Brown has an M.B.A. from York University's Schulich School of Business in Toronto, Canada. To create compelling blog posts, Anne draws on her business experience serving corporate clients from 18 countries and her travel to 24 countries. Anne Thornley-Brown has extensive business experience in a variety of industries including banking, wireless communications, high technology, transportation, the non profit sector, and film and television. Anne focuses on strategies to spearhead organizational change, improve team building effectiveness, and boost the R.O.I. of corporate team building, and executive retreats. Team building is one of the most effective tools that executives have at their disposal to fuel corporate success. Yet, it is often underutilized and lacking in focus. By understanding the complex nature of team building and the subtle choices that influence success, executives can unleash the power of team building to boost bottom line results. The global geo-political is undergoing massive transformation.Uncertainty is causing many companies to curtail spending on consultants, facilitators and team building. Off-sites have become rare. Yet, foolishness and folly are taking over the corporate agenda....the more outlandish the better. Everything from axe throwing to smashing objects in rage rooms to mud obstacle courses have become the order of the day. Some of these pose a risk of serious injury....and a lawsuit! Team Building, Innovation, and R.O.I. : An Executive's Guide to Boosting the Bottom Line is a call for a return to sanity in team building. 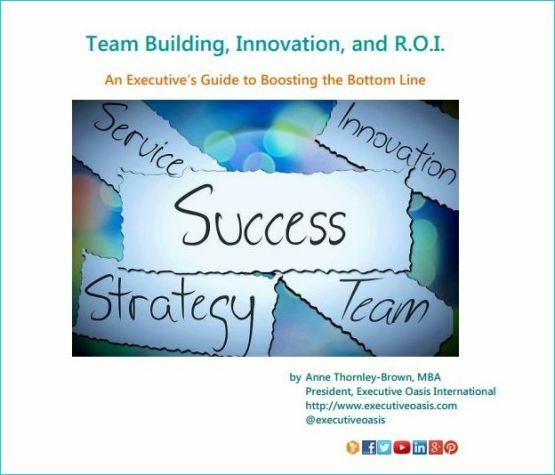 This 55 page e-book is designed to stimulate discussion and an exploration of how team building can, once again, be used by executives as a vehicle for boosting the bottom line. You'll walk away with tips, tools and proven strategies to improve the effectiveness of team building and executive retreats. The strategies and tips that I have included are based on the missteps that I have observed companies make over and over again during the past 20+ years. the steps involved in measuring team building R.O.I. Anne Thornley-Brown has created a very thorough review of the issues that should be considered to make best use of the time allotted by the company and employees to achieve particular company/team goals. Most company success comes from the direction and vision at the top. There is no better place to set the direction, seize a particular "opportunity" and demonstrate the talk you walk and that you walk the talk. Congratulations on your success in the niche you have carved out. Good luck with the e-book. Executive Oasis International has an active and strong social media presence. Our President has managed a number of virtual communities. Focus: Anne launched this blog due to concerns about companies substituting recreational activities and extreme activities for "real" team building and eroding the credibility of the industry. Anne shares tips and strategies for boosting the impact of team building without shying away from exploring team building pitfalls. What Does "Real" Team Building Look Like? Does team building have to involve competition to be effective? Focus: This blog has a personal touch. Anne started it to capture her experiences and photos from around the world. Her travel to 24 countries so far have definitely shaped her approach to team building and corporate event planning. Anne invites readers to follow her journey and pick up ideas for destinations to host executive retreats. Focus: Personal views on a range of topics from team building to travel and the arts. B2B Social Media Marketing: What's the Real Deal? Is Corporate Team Building a Waste of Time? Who Loses When Organizations Overspend on Team Recreation? Does Racial Stereotyping Undermine Team Building? Focus: Executive Team Building and Social Media. 2 Hour Team Building: What's up with that? Corporate Culture Lessons from Star Trek: Why teams should avoid the "hive" mind? Virtual Reality: Who is using it for events? Focus: Team Building Best Practics. Can Team Building Boost Bottom Line Results? Can you Travel, Build Your Team, Boost Business Results & Have Fun? We do not specialize in activities that are strictly recreational. Team Building Facilitators: How Do They Add Value?